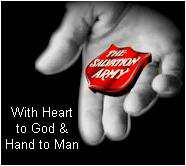 The Salvation Army strives to be timely and efficient as it examines and addresses needs within a community. It continues to seek ways to change people's lives by elevating the human spirit through the gift of christian love. We lift people up - get them on their feet - help them grow in all dimensions of life.